If I were you, I’d want to know what I brought back to make/do. So what did I bring back in my suitcases? My sis will have that cat panel on the site soon, I hope and the Guardians panels are already there. My son saw it and gave me a suggestion as to how to add fabric around it to make it amazing. Some of Rachael’s packs that she’d like me to make into quilts! That’ll be a challenge! They are as follows: You can buy them if you want and if she sells out I won’t need to make up any patterns to help her sell them! Some fabric I saw that my sis has a lot of that isn’t moving in the store but is quite pretty. I also brought coordinating solid fabrics in order to make up a pattern. Some fabric to make a farm themed quilt for a give away for next year as an advertising gift for their Farm Bureau’s dinner. They have over 600 local citizens and many business owners. This will be for advertising to our community in Florida. I’m going to make this fabric in front the featured fabric. This one is going to be a queen size quilt. I’ll make up some pillow cases or shams or decorative pillows when I’m finished with the main quilt - will see how much fabric I have left. Some fabric to make up 2 John Deere panel quilts (twin sized) for Farm Bureau door prizes for next fall. Lest you think these are too big for that, the big prizes generate a lot of interest. This past year a couple of chain saws were given away and we are sure they go for $300 and more. To the left is my snowball quilt I spy top and the others are panels I added borders to. I wanted to get them quilted but didn’t make it. Three quilt tops I didn’t get finished while in FL. I’d like to finish them up soon. It was causing me too much stress to even think about making them as I didn’t have a good place to sandwich them and my sis’s machine has a small throat. I could do it, but decided to just bring them back with me and do them here. I took a textiles class a long, long time ago while getting my undergraduate degree. It is time for a complete refresh. I’m much more excited about this than I was about my original textiles class! And now you know! These are all new things - things I didn’t plan on bringing back with me. I’m tickled about the Spiderman panels. I was out of anything like that. 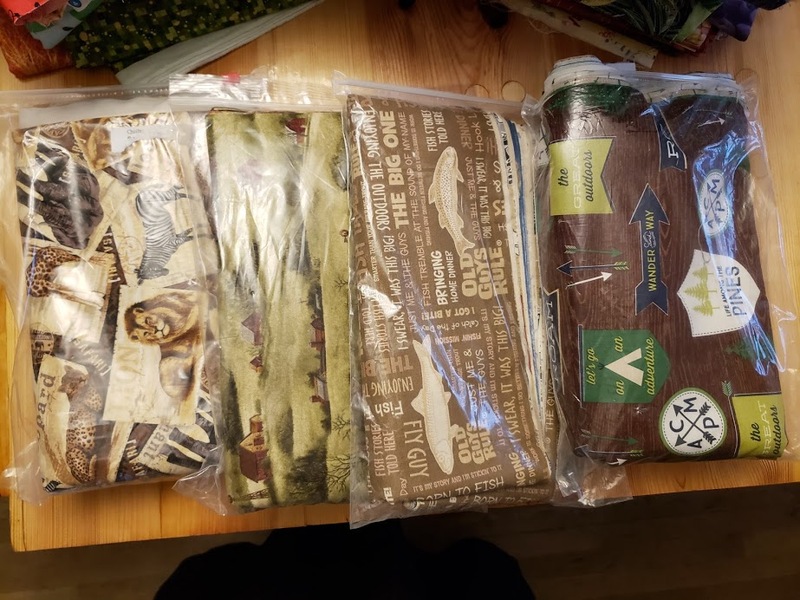 I also brought back some blender fabrics that my sis had, and some fabric slipped into my luggage when I was folding it to be sold as individual pieces. I also found some other goodies at a discount store I went to along the way. I also brought back a couple small templates, 2 rulers as well as some paper tape rolls someone sent me to use! So this list isn’t comprehensive - it just represents the projects that are now on the table! But just in case you need some things for your quilting, be sure to check out what my sis has for you in the store!